Entries to the Edinburgh Marathon are on a first come, first served basis until capacity is reached. Please note: you need your special entry code VMLM2019. This code expires at midnight on 31st October 2018. ENTER NOW! Charity runners will be given an individual fundraising target. Click on one of the below charities to run for your chosen charity. Cancer is the toughest fight most of us will ever face. But no one should go through it alone. 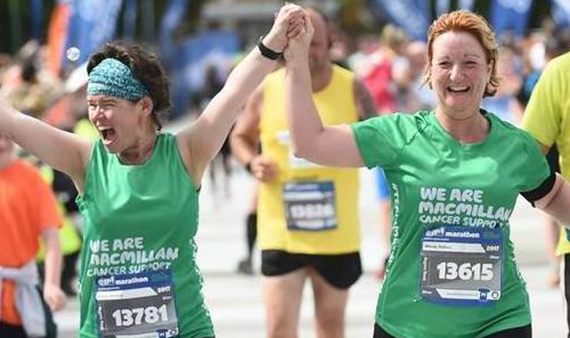 The Macmillan Team is with you every step of the way, from the nurses and therapists helping you through treatment to the campaigners improving cancer care. So run for Team Macmillan to help ensure that we can be there for everyone affected by cancer. We’ll fully support your running challenge with plenty of helpful tips, a free running top and we’ll also be there on race day with cheer-points and a post-race recovery area. We are very proud to present our five Premier Affiliate Charities. They each work tirelessly for those battling some of the UK’s most common and deadly diseases, BUT they can’t do it without YOU! Read on to decide which of our Premier Affiliate Charities is closest to your heart and join their team today! Save the Children believes every child deserves a future. In the UK and around the world, we give children a healthy start in life, the opportunity to learn and protection from harm. Taking on a challenge calls for a special type of dedication. And that’s something we know all about. Are you ready to do whatever it takes to help? Then sign up to run for us today.